Last year John and I got to go round McLarens and have dined out on the story ever since. Jane was invited but she couldn't make it that day so when Steve Roake popped the question she nearly had his arm off! She returned full of enthusiasm and may even start following the Grand Prix. 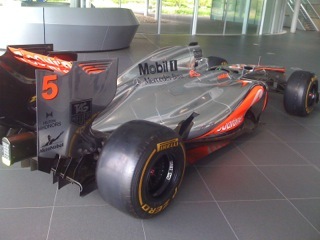 Having chatted about her visit it is interesting to note how much things have moved on in just a year at McLarens. Here's her take on the day. It was a lovely sunny day in Sussex inspecting at Ebernoe when Steve Roake popped in to see how it was all going and to get his logbook updated with the latest SB. Conversation as ever with Steve was varied and after expressing his interest in old converted barns he was privileged to get a tour of Graeme Scaife’s house, a superb example. From this came an offer from Steve to have a tour of McLaren where he has worked for the last 25 years. Wow, I wasn’t going to miss this and so it was a couple of weeks later I met up in Woking with Steve, Richard Ashford, his missus Emma and Graeme , who appropriately came along in his E-type Jag, top open and cap on head. Steve drove around the corner and as we turned right off the roundabout it was like driving into another world. 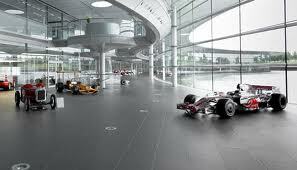 The McLaren complex is completely hidden from the road by ecological landscaping, beautifully manicured grass and a wealth of mixed mature trees of every genus imaginable. 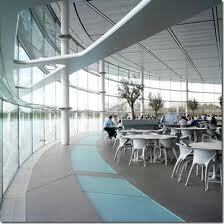 In front of us was a huge conceptual building of curves, glass and a lake above which was a well hidden helipad. It was designed by Norman Foster who also designed Wembley Stadium, the Millenium bridge, the Gherkin and Stansted airport terminal amongst many famous worldwide buildings. We entered via “the basement” entrance and walked along corridors befitting a Bond or Sci-fi space movie, all “off white” grey and spotlessly clean expecting to see a man with a white cat at the end! From here we ascended stairs and the wow factor hits you as in front is a concourse with just about every race car McLaren has built, all complete and all in running order, not a drop of oil in sight, gleaming chrome bits and plaques telling us what accolade they had won and who the driver was. Alongside these was a road race bike, stronger than a normal bike but we could pick it up with a finger, made using the latest technology for Mark Cavendish who on it became World Race Champion. They have certainly won a wealth of trophies, all of which are in wall cabinets lining the next corridor, yards long and loaded with gold, silver, glass, enamel and all sorts – too many to even think of the value! I thought McLaren was all about racing cars but Steve explained that it is a group of companies who all are successful and profit making in their own right, the racing side is just one. Automotive make supercars and their company GT3 Racing make cars for things like Le Mans, winning examples of which we saw on the concourse. Their Electronics company is supplying high-tech innovative equipment to all the F1 teams. We could see through one glass window a machine that a car sits on and, using GPS, it simulates driving conditions, including every bump, nook and cranny of every race track so it can be modified to get the best drive for each race – impressive. 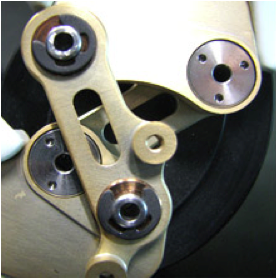 For me the Applied Technologies was the most fascinating as it has all sorts of uses and developments by McLaren. Using data from the body collected remotely has helped in fitness and health, performance for athletes, the military and even the development of false limbs. Team GB cycling, canoeing and rowing are all examples of success from the precision engineering and data use. Steve showed us how they use different types of carbon fibre and explained how important it is to get the right type and layers for the job in hand and how everything is tested and checked at every stage to ensure that quality control is at a maximum, light weight, with maximum strength and safety and aerodynamic, and then checked again. The seats for the racing cars are even designed around the driver’s bum and their crash helmets engineered to each individual. Emma proudly said she has a picture of her holding Jensen Button’s helmet after it was left in a room of one of the hotels she runs but she didn’t realize quite how much it was worth! We went to the works canteen for a cup of coffee. A large airy room with olive trees in huge tubs and overlooking the lake to the helipad, unfortunately we didn’t get to sample food from the Absolute taste company which does expensive beautifully presented nosh for race day clients, posh functions and has cafes in places like Harvey Nicholls and Burghley House and no doubt is served up to prospective supercar clients in one of the executive suite clients reception rooms that have names of drivers such as ‘James Hunt Room’, ‘Ayrton Senna Room’. Down some open stairs below the canteen was a lounge with more of the modern furniture which furnishes the building, all in the same modern but sort of retro 60’s style, Conran meets Dahli, and all aesthetically tasteful curves. Emma and I had to quickly sit ourselves up and down like naughty kids trying out each chair while no-one was looking, well, except the larger than life poster of Jensen smiling down from the wall, and agreed we would look on Ebay when McLaren decided to refurb. Beyond this was a fitness and health centre where drivers and engineers can workout and get fit with proper fitness programmes, we could see a fantastic swimming pool through the glass doors, very tempting. Just below the main concourse of racing cars we could see the “workshop” where the old cars are maintained and kept in racing condition, the benches and floors were spotless and not a loose tool in sight (noted for our workshop)! There was also a “workshop” where the engineers practice changing wheels and refuelling very quickly using a big jig-type piece of equipment and a horse-shoe shaped bespoke tyre-rig that Steve made – he’s a clever chap. The four hours we spent with Steve seemed like about one, we were all absolutely wowed by the whole place. It had a lovely atmosphere, probably because everything was curved and in the “right” place and despite being clinically clean (NHS hospitals should use McLaren cleaners) it was sort of homely and inviting with simple big flower arrangements and of course being mostly made of glass was light, airy and the outside views inviting and carefully landscaped to advantage. Still buzzing from so much awe inspiring stuff I hardly noticed driving home down the M25 in my Dad’s old-persons Kenari Perodua, not quite on a par. I think the vehicle I would take home though would be one of the big new container Mercedes lorries that we saw coming in and out, that would make a splendid horsebox and easier to drive than poor old Frank! A huge thank you to Steve for giving up his time on a day off work (and flyable) to take us back in there and giving us such an informative look around and I will never look at F1 the same again now I know what it involves and how much it does for improving technology in all walks of life and for the British economy. I think I might don my one posh frock and ask Captain Lovell to swan me over there in his helicopter to have a test drive in a Supercar – not sure I could pull it off though.